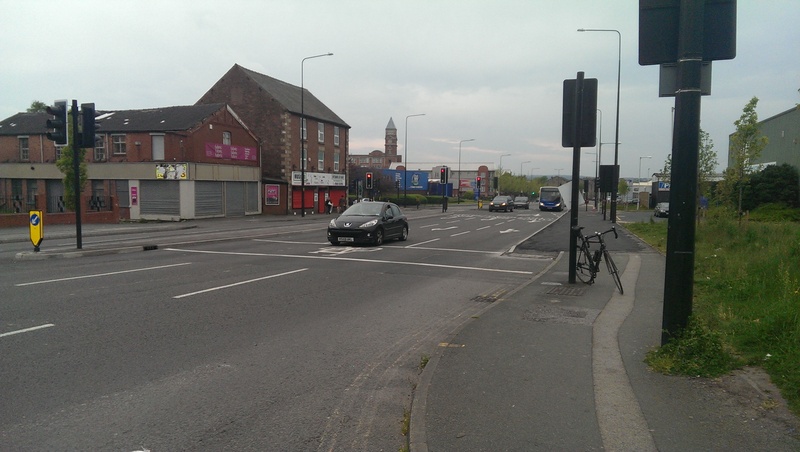 Having read on Twitter about the proposed £685k investment into a cycle safety corridor from Wigan town centre to the A577 at Orrell I was immediately very interested. This is a huge amount of money in cycling infrastructure terms and should be used to create something that is useful, improves safety and encourages cycling. 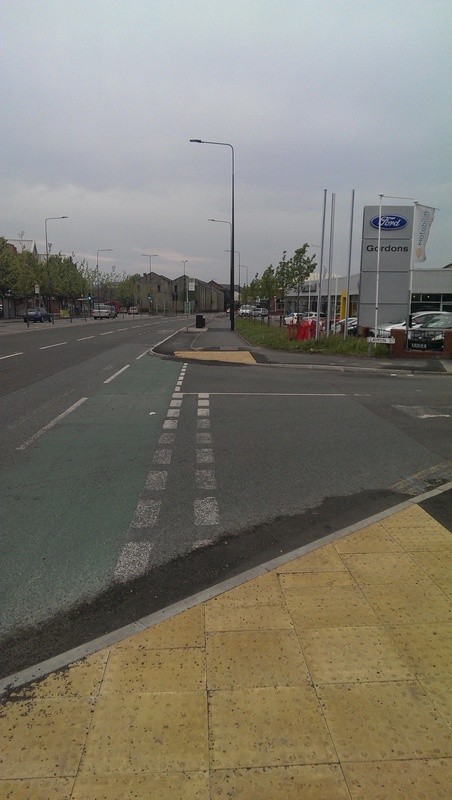 This is an important step forwards in an area where good cycle infrastructure is difficult to find. So I nipped along today to see how things were coming along. Now to be fair, I very rarely cycle in Wigan so I’m not hugely familiar with the cycle provision along this route before the investment but on the Wallgate to Worsley Hall section I rode today I remember a Bus lane heading out of Wigan town centre and a narrow, painted cycle lane heading in. 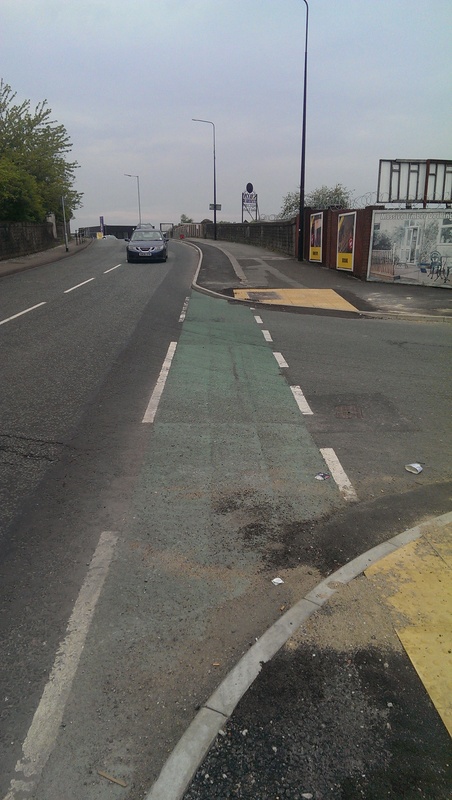 The bus lane still remains and the new cycle lane has been built where the painted cycle lane was. 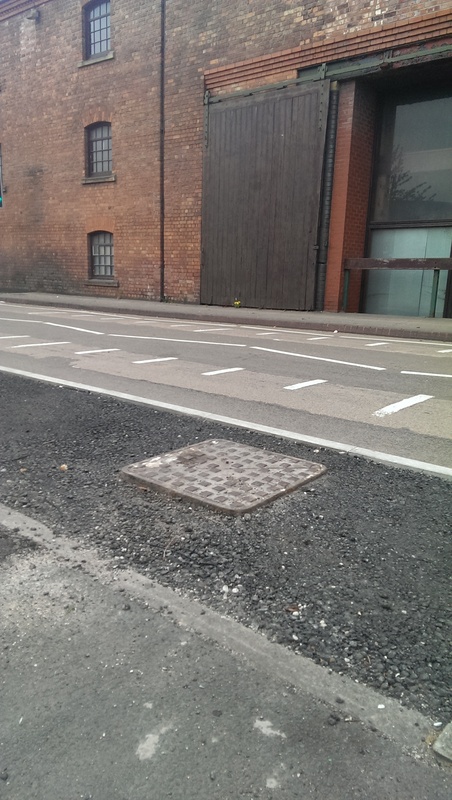 To be clear, the engineers have extended the pavement along the full route into the space previously occupied by the on-road cycle lane. No space has been taken from vehicles for this provision. The lane is clearly still under construction despite the newspaper report but I have no idea how much more construction work will take place. Lets look at the lane itself. 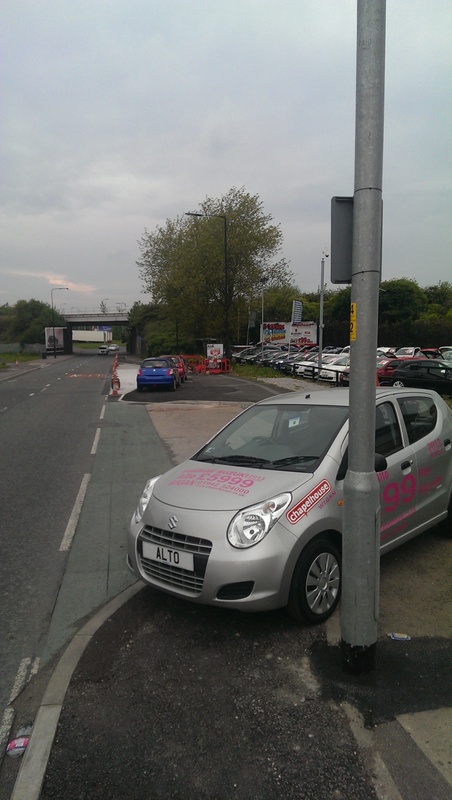 Here’s where it starts just after the Wigan Wallgate railway bridge. The first problem is immediately evident. 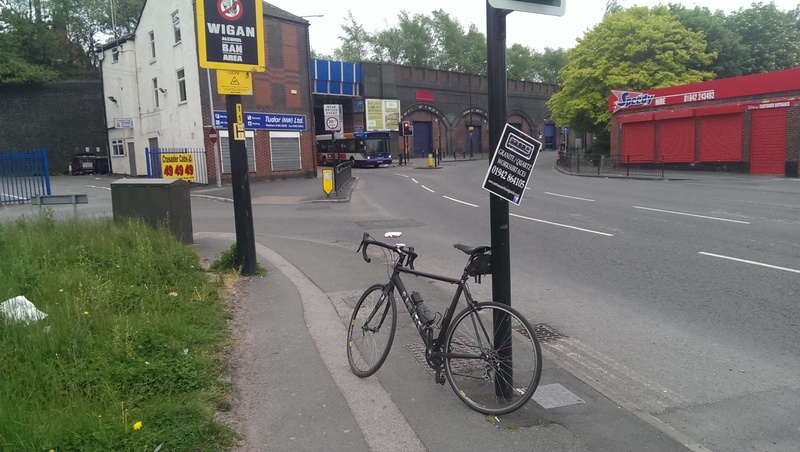 While cyclists heading into Wigan can ride into the ASL, there’s no way cyclists heading out of Wigan can access the path. I had to wait for a gap in the traffic, cross 4 lanes of traffic and pass over the central reservation to get here, something that’d be impossible in rush hour traffic. Looking the other way we can see the pavement that leads into Wigan town centre under the bridge but it’s not a cycle path and there is obviously no provision for cyclists leaving the town. Following the path from here down past Wigan pier reveals a number of worrying implementations. You can see where the old cycle path used to be. Still, some people like it. The people who run this car showroom for example. The bridge in the last shot is as far as I went and as far as I could safely go as the proposed toucan crossing that will take cyclists across to the left hand side doesn’t appear to have been built. 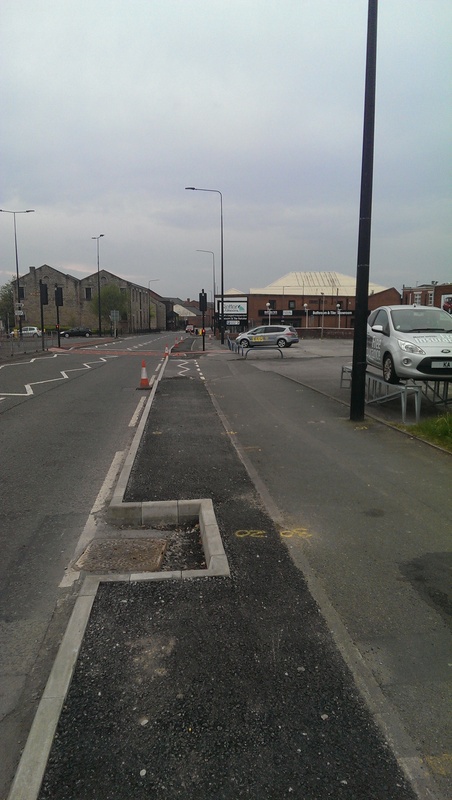 If it isn’t built the whole lane will be a complete waste of time as it will only be useful for people heading in one direction and then only if they’ve elected to brave the Worsley Hall Saddle gyration which quite frankly terrifies me in a car never mind on a bike. Impression so far then is very poor. 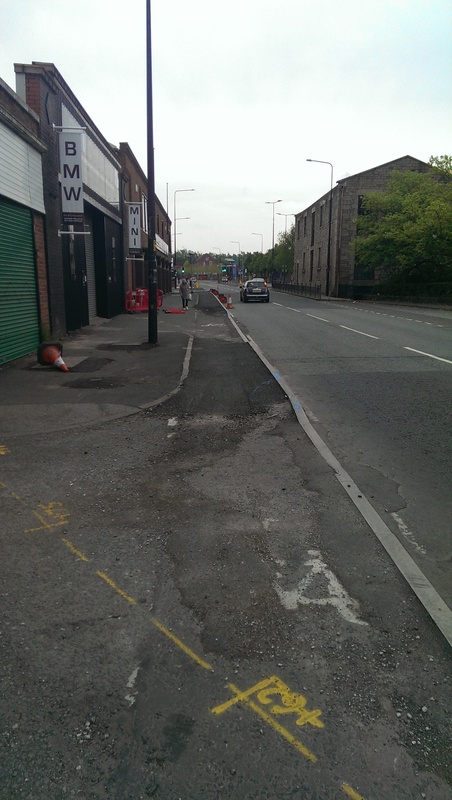 Even if the lane is properly surfaced and signed, the cyclist experience is now worse than before along this section at least since cyclists will need to stop at every side road as well as having to share the pavement with pedestrians.